In 1891 a French inventor named Carron produced plans for a device he was sure would "delight the lovers of sensational emotions." 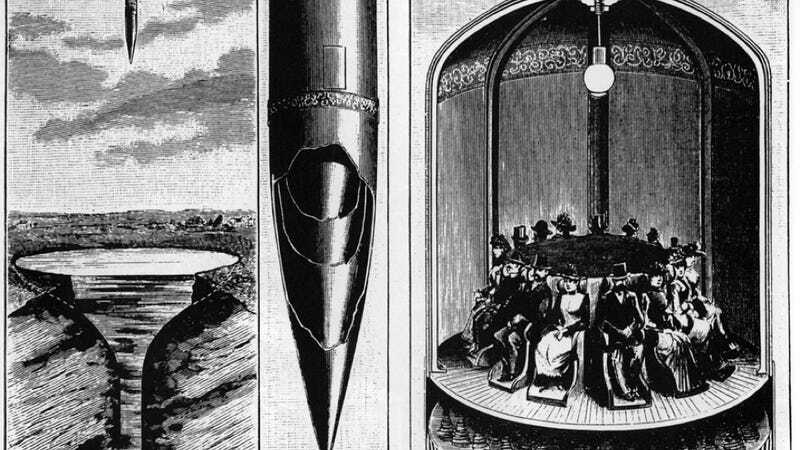 His idea was to drop a bullet-shaped steel shell from the apex of the Eiffel Tower into a pool of water 1000 feet below. Inside the shell would be 15 passengers presumably enjoying the sensational emotion of being weightless for a couple of seconds. "If Mr. Carron's calculations are correct," suggested the magazine La Nature, the shell would hit the water at a speed of over 170 miles an hour, "a speed at which no human being has ever traveled as yet." Making a free fall such as this, continues the reporter's breezy understatement, "will indeed be a vertiginous experience." It is easy to fall 1000 feet, he points out to those who probably never gave doing so much thought, "but it has hither to been doubtful whether one could do this and survive." His machine would consist of a streamlined shell 33 feet tall and 10 feet in diameter. The padded floor is supported by huge springs. The business end of the shell consists of concentric cones, apparently intended to collapse upon impact...the idea apparently being to rebuild the shell after every drop. The whole thing would weigh ten tons "including the electric lighting." It would be dropped from the top of the Eiffel Tower into a pond lying between the legs of the tower. The pond would be in the shape of a champagne glass about 150 feet wide and 180 feet deep. We are assured by M. Carron "that by virtue of this, and because of the springs inside, the shock felt by the occupants on landing will be in no way unpleasant." Carron expected that a nice profit would be made charging just 20 francs per passenger, "by no means an excessive charge for for such a vertiginous experience as this promises to be."